ALL YEAR LONG. WHEN WE HAVE COLLECTED ENOUGHT GOODS & HAVE EXPENSES COVERED WE SHIP OR DELIVER TO THOSE IN NEED. This information is over 10 years old and the author has since passed on to the spirit world. Despite the time lapse not much has changed over the years. Wall Street Journal calls Pine Ridge Reservation the POOREST place in the Western Hemisphere, next to Haiti. Further, Rosebud Reservation next door is no better. We are a grassroots volunteer charity. we strive for 100% of all donations to reach those in need. Our Board, Staff and Volunteers have agreed to accept no salaries for our work with this corporation. Our efforts are to ensure the continual movement of donations and supplies to our fellow Native Americans who are truly in need. Our motive is the sincere desire to serve from the heart, as our ancestors did. Some of these dedicated volunteers have decades of experience in humanitarian programs, working unselfishly while receiving payments of warm smiles, thank you hugs and heart felt love. There is no greater satisfaction of the heart then to see the smile on a child’s face when handing them a toy or an elder’s smile upon receiving a warm blanket. There is no greater joy then to serve those who can not serve themselves. AIHF charges “NO” fees for any services provided. AIHF does not assume responsibility for errors, and all information provided via this Web site is intended for informational purposes only and is subject to change or withdrawal by AIHF at any time without notice. Links from these pages to external Web sites are provided as a service to visitors and do not constitute an endorsement by AIHF. 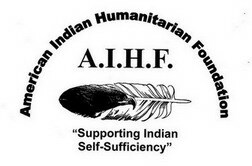 Certain programs, services, projects and links listed here are not operated by nor are they the responsibility of AIHF. Some information published herein is gathered from sources which are thought to be reliable, but the reader should not assume that the information is official or final. "For Faster Mail Response Time"